I observed this male tiger namely USTAD (T 24 )for the first time on 1st October 2011 on the very first day when the park opened in winters in the after noon safari when the park was emerald green as the park had best of the rains and each and every water body was full of rain water and at some places oozing out of the lake. To see a tiger in the lush green jungle is a lifetime experience. However the shots of T 24 in the morning of 9th March 2013 when it was sitting inside the bushes and a ray of morning sun was just falling on the face was amazing. 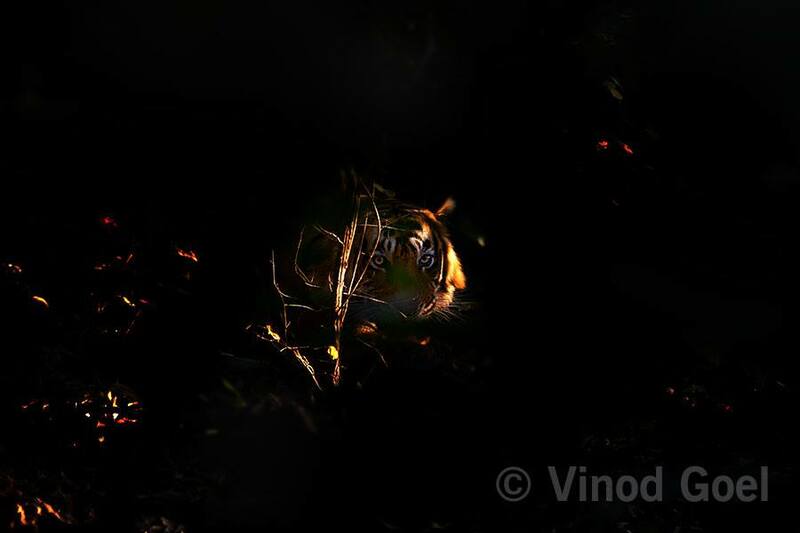 Although I have been seeing this tiger for a number of years and it had given me beautiful shots but the shots of 9th march 2013 is every wildlife photographer dreams. This tiger was shifted to Sajjangarh Biological Park in Udaipur on 16th May 2015 as forest managers as well as other stake holders were of the view that Ustad had turned man eater as it had killed 2 forest guards on duty as well as a number of villagers in a span of 5 years or so. But the wildlife freaks, Wildlife Photographers and the tiger lovers and people in general who had seen him posing near the road leading to the fort and in the park ,were of opposite view .They still believe that it is still ruling their hearts. A song from a Hindi movie AITBAAR reminds of him. Image taken on 9th March 2013 at Ranthambore Tiger Reserve in Rajasthan.